[Kris]’ house/office has a huge store window, and instead of covering it up with newspapers, decided to do something cool. He’s had projections and other art pieces on display for his neighbors, but his new storefront arcade game very likely beats all of those. Every video game needs a display, and this one is no slouch. The display is a 16*90 matrix of WS2812 LEDs with inset into a laser cut grid and put behind a layer of plexiglass. With this grid, the display has a great raster effect that’s great for the pixeley aesthetic [Kris] was going for. 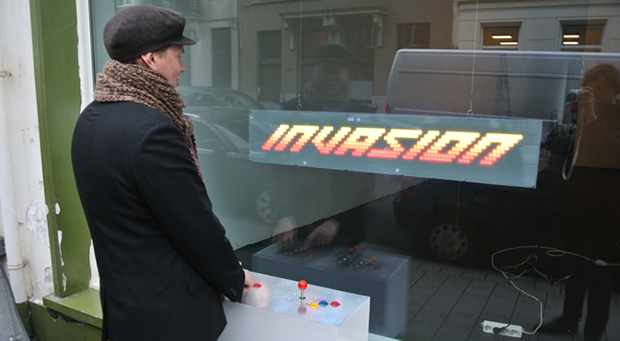 In front of the window is an MDF and steel arcade box powered by an Arduino Due. The game is driven by the Adafruit neopixel library, with a few modifications to support alpha blending. There’s no external memory for this game – everything is running on a second Arduino Due inside the window. It’s a great looking game, and if you’re ever in [Kris]’ area – behind the zoo in Antwerp – you’re free to walk up and give this game a spin. Wow. I’m loving that display–the use is absolutely ideal–and it’s controlled by *only* one Arduino to boot. The zeroth one handling the joysticks and sound, and the first one driving the display. *That* display used a single Arduino for *four* monochromatic digits (24 LEDs per Arduino), requiring 48 Arduino boards for the entire display, acting as slaves to a RaspPi, and thus my comment. I imagine with *this* project the two Arduino boards were used because running an RX/TX pair to the outside is a far more appealing solution than running 16 wires for the controls. This looks amazing! I love the aesthetic! Cool. Too bad though he didnt use better materials. Something makes me think this will be destroyed by nature in a year or two. The outside box is MDF with only a steel top, so rain will destroy it. And I doubt the arcade controls have a appropriate IP rating either. I don’t know about Antwerp but here that thing would be trashed by some punk in about 5 seconds! That’s why we can’t have anything nice. Is there a demographic for “punks”? I thought not. Unfortunately there isnt a article for Belgium, so the UK will have to do just to prove this isnt an American thing. Are you trying to say something here without quite saying it? Come on! Be a proud Belgian! Put your thoughts into words! Wouldn’t that have to be CE and RoHS certified when available to the public? Serious question and preemptive “whooshing”, wouldn’t that only matter if he were selling it? Yes, CE is required when a product is ‘put on the market’. Putting something on the market in Europe is very broad, even if you use it yourself it has been put on the market (depending on who you ask even if you make it and never turn it on). It is not a certification however, you can ‘self-certify’. You need to make a technical file showing the system conforms to applicable standards, and of course attach the CE label to the thing. Some devices need approval by a notified body (gas heaters, some food processing things, etc), but probably not this device.